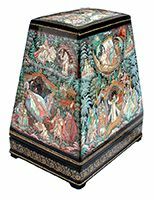 This gorgeous five-sided casket was painted by a famous Kholui Master, Mikhail Veselov. Each side shows scenes from a different Russian fairy-tales. The scene on the top is based on the Pushkin's "Tale of Sleeping Princess and Seven Bogatyrs".It shows the seven bogatyrs; each of them proposes marriage to the Sleeping Princess. We can see Prince Yelisey asking the Moon where he can find his beloved Princess, and the Queen's servant who has come to the house of seven bogatyrs to kill the Princess with a poisoned apple. On the left-hand side we can see sleeping Kingdom. The painting is based on the popular story of, "The Sleeping Beauty". This story was originally put to pen by French writer Charles Perrault in 1696. The little long-awaited Princess was born in the kingdom. Her parents organized a sumptuous feast and invited seven young fairies. In those times fairies had a marvelous custom to endow their goddaughters with merits and virtues. When the feast was about to begin, the aged fairy appeared whom no one had thought to invite because people supposed her to be dead or bewitched. She declared that the princess would prick her hand with a spindle, and die of it. The King, the Queen, and all the guests were very afraid of this terrible gift. But at this moment one of the young fairies said: "Take comfort, your Majesties, your daughter won't not die. The princess will indeed prick her hand with a spindle. But instead of dying she will merely fall into a profound slumber that will last a hundred years. At the end of that time a king's son will come to awaken her". The prophecy came true. But not only the princess but the whole kingdom fell into a deep sleep. The front side shows a Flying Ship from a tale of Seven Semeons.This tale tells about seven orphans who were adopted by the Kind. Each of them promised the Tsar to master a separate skill. The first Semeon wanted to be a smith and promised to erect a pillar so tall that it would almost touch the sky. The second Semeon said that he would climb that pillar to keep watch on what is happening in the surrounding kingdoms. The third Semeon promised to become a ship builder. The fourth Semeon said that he would be the captain of that ship. The fifth Semeon said that he would be able to take that ship to the bottom of the ocean. The sixth Semeon said that he would be able to bring that ship up from the bottom of the ocean. And to the Tsar's surprise, the seventh Semeon answered that he wanted to be a thief. The Tsar was not pleased by his answer and warned him that he put thieves in his kingdom to death. The years passed and the seven Semeons had become grown men. One day the Tsar gathered them to see what they had learned. Each of them demonstrated the tsar his skills. Most of all the tsar liked skills of the second Semeon who could climb the high pillar and told that he saw Elena the Fair in the neighboring kingdom, and most of he disliked skills of the seventh Semeon as he indeed became a thief. The tsar was about to hung the seventh brother, but changed his mind when the thief promised to steal Elena the Fair with the help of this brothers. Owing to their skills the brothers could successfully steal Elena the Fair and returned to their kingdom. Later the tsar and Elena fell in love with each other, while the seven Semeons married Elena's maids. The back side shows a scene from tale of Sivka-Burka. It tells about the adventures of the youngest of three brothers, Ivan the Simpleton. For his courage and easy temper, his father presented him the magic horse, Sivka-Burka that was ready to serve Ivan. With the help of Sivka-Burka's magic powers, Ivan managed to jump to the highest tower in the king's palace, where the king's daughter was standing, and take the ring she was holding. This made him the victor in a contest, and for performing this feat he was allowed to marry the tsar's daughter. The magic horse Sivka-Burka reaches the balcony where the princess stans and Ivan has time to take her ring and even to kiss her. The tsar and all people of the kingdom open their mouths with amazement. Ivan is a winner, and now the princess must marry him. On the right hand side of the casket we can see composition based on the tale of the Apples bringing the youth or "The Apples of Youth and the Water of Life". The old Tsar dreams of returning him youth and being young again. He sends his three sons to carry him the golden apples and the water of life. With the help of the golden apples, he hopes to become young again, and with the help of the magic water, he intends to heal his poor eyesight. Having been tempted and deceived by a wicked maiden, the elder brothers are taken prisoner, while their young brother Ivan Tsarevich manages to fulfill this task. Here the artist has depicted a wonderful assembly of scenes from this tale to acquaint the viewer with its plot as well as possible. In the right upper corner of the composition we can see one of the elder brothers languishing in captivity of the wicked maiden. In the left bottom corner the Blue-Eyed Maiden sleeps near the well with the water of life. In the center of the composition Ivan Tsarevich has stolen the apples of youth and the water of life from the garden of the incomparably beautiful Blue-Eyed Maiden, and now he tries to elude pursuit. In the right bottom corner Ivan Tsarevich rides the magic steed given to him by Baba Yaga and a little below the artist depicts the Blue-Eyed Maiden. In the left upper corner the bird Nagai carries food to its nestlings, and next to this scene we can see the Blue-Eyed Maiden washing in the bathhouse. Having discovered the loss of her apples, she decides to punish the thief and starts pursuing Ivan Tsarevich. Baba-Yaga and her sisters contrive different methods to detain her: one of them offers her to drink milk, the other one offers her to eat pancakes and the third one offers her to take a steam bath in the bath-house. The details in this composition expose Mikhail Veselov as a true Master of his craft. Detailing enhances architecture, facial expression and landscape. Purposeful precision. The colors that he takes from his palette are light greens, yellows, browns and reds. Gold paint is used to outline and highlight areas of emphasis in the scene. This is done with subtlety and an eye for artistic integrity. The edges of the lid and the sides of the box are adorned with elegant gold and aluminum ornamentation. The bottom of the casket is also decorated with gold and aluminum filigree ornamentation. The casket is made of paper-mache. The casket's exterior and interior are covered with red lacquer. The casket has a hinge, and the box rests on the four legs. The artist completes the piece by writing the title of each tale, Kholui,2016 and his name in gold paint under EACH composition.